The amount of salary arrears for five months of the current year grew by 8.1% and exceeded UAH 2.5 billion. This indicator is close to the record mark of the current decade. 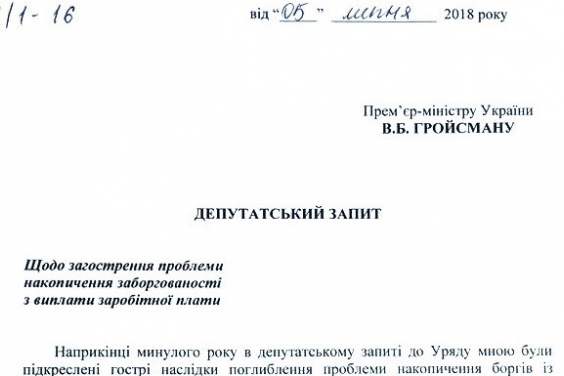 Deputy Head of the Opposition Bloc faction Serhiy Lovochkin appealed to Prime Minister Volodymyr Groisman with a request demanding the government to eliminate this debt. The MP recalled that at the end of last year he had already appealed to the head of the government with a deputy request, which warned about the acute consequences of deepening the problem of accumulating salary arrears. However, in response to the Ministry of Social Policy there was received an information without systematic steps that could fundamentally correct the situation. “The deterioration in the state of salary arrears observed since the beginning of the current year has become the result of the ineffectiveness of the actions of the Cabinet of Ministers of Ukraine in this direction. The volume of salary arrears has increased by 8.1% and exceeded UAH 2.5 billion for 5 months. This indicator is close to the record mark of the current decade reached by the results in November 2017. A particularly alarming tendency is the outpacing growth in the volume of salary arrears to the groups of economically active enterprises – by almost 11% for the first five months of this year,” Serhiy Lovochkin emphasized. According to the MP, the analysis of the sectoral distribution of the arrears shows that the industry, where more than 79.5% of the salary arrears is concentrated, remains the leader in the volume of non-payments. As of June 1, 2018, it exceeded UAH 2 billion. According to him, due to the lack of effective steps on the part of the government to solve the problems of chronic salary arrears, particularly in the field of thermal communal energy, there was an increase of salary arrears in the sphere of electricity and gas supplies in 1.5 times – as of June 1, its volume exceeded UAH 212 million. “The rapid increase in salary arrears in healthcare and social assistance (by 62.4% since the beginning of the year), which is happening instead of the salary increase promised by the government, is also worrisome,” the MP said.